Associazione Calcio Milan (Italian pronunciation: [assotʃatˈtsjoːne ˈkaltʃo ˈmiːlan]), commonly referred tae as A.C. Milan or simply Milan, is a profeesional Italian football club based in Milan, Lombardy, that plays in Serie A. Milan wis foondit in 1899 bi Inglis lace-makker Herbert Kilpin an businessman Alfred Edwards amang ithers. The club haes spent its entire history, wi the exception o the 1980–81 an 1982–83 saisons, in the top flicht o Italian fitbaw, kent as Serie A syne 1929–30. 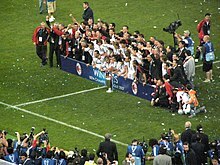 A.C. Milan lifting the European Cup after winning the 2002–03 UEFA Champions League. Milan players celebrate winning the Champions League 2006-07. ↑ "Organisational chart". acmilan.com. Associazione Calcio Milan. Archived frae the oreeginal on 7 October 2010. Retrieved 4 October 2010. ↑ 2.0 2.1 2.2 "History". acmilan.com. Associazione Calcio Milan. Archived frae the oreeginal on 7 October 2010. Retrieved 4 October 2010. ↑ Neil Heath (17 November 2009). "AC Milan's Nottingham-born hero". bbc.co.uk. British Broadcasting Corporation. Retrieved 4 October 2010. Wikimedia Commons haes media relatit tae A.C. Milan.